PHP Tools for Visual Studio provides a debugging environment for finding and correcting errors in client-side scripts in PHP pages. Before you are able to begin debugging script with Visual Studio, the script debugging must be enabled in Internet Explorer. For more information, see How to: Enable and Start Script Debugging from Internet Explorer. In Visual Studio, you can use the Solution Explorer to see the lists of server-side and client-side script documents. Any script document can be opened from the Solution Explorer. For more information, see How to: View Script Documents. In Visual Studio, you cannot directly debug server-side code, but you can set a breakpoint in a server-side file. Visual Studio automatically maps the breakpoint to a corresponding location in the client-side file and creates a mapped breakpoint in the client-side code. When a PHP Web project is launched in debug mode and Internet Explorer is used as browser, PHP Tools will automatically attach the client-side script debugger. 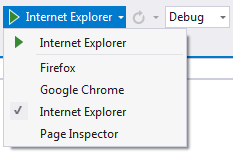 In VS2010 the system default browser is used. In VS2012 and higher user can choose active browser from browser switcher. Breakpoints must be set inside <script> blocks. Breakpoints in inline script or <? ?> blocks cannot be mapped. The browser URL for the page must contain the page name. If you have, for example, http://devsense.com/index.php. Breakpoint mapping cannot recognize a redirection from an address such as http://devsense.com to the default page. The breakpoint must be set in the page specified in the browser URL, not in another file included by that page. Breakpoints set in <script defer=true> blocks cannot be mapped. For breakpoints set in <script id=""> blocks, breakpoint mapping ignores the id attribute. The breakpoint must be set in the page with the php file extension.